Install photovoltaic panels and generate your own power. Photovoltaic panels collect energy from sunlight and convert it into renewable electrical energy that can be used to power lights and appliances in your new home. As a self builder, you are in an excellent position to incorporate the system into your house design and generate electrical power without producing any CO2. 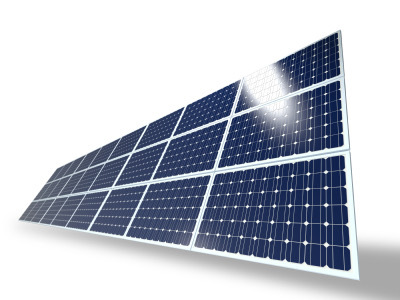 Most photovoltaic panels are manufactured using silicon based semiconducting materials. Light energy or ‘photons’ penetrate the panels and are absorbed by the semiconducting materials, displacing electrons in the process, creating an electrical potential difference or ‘voltage’. The photovoltaic cells are designed so that displaced electrons flow in one direction producing a direct electrical current (DC). Appliances and lighting systems in our homes operate using alternating current (AC) as supplied by utility companies. It is therefore necessary to convert the DC current produced by the solar panels into AC. This can be done using an inverter. The power generated can be used immediately, stored in batteries in its DC state or fed back into the electricity grid. Unless you are building in a location without access to the grid or would prefer to utilise batteries and remain off-grid, the most common arrangement is a grid connected system. You can feed excess power generated at peak times back into the grid and be paid by energy suppliers for doing so. Your own energy production can be supplemented by mains power when your output is not sufficient to meet demand. Photovoltaic panels are available in a range of formats with various shapes and colours available including transparent units. They can be surface mounted, integrated into the roof and are even available in roof tile format. If you are self building you can research the options and integrate panels into the overall design seamlessly at the design phase. Although photovoltaic panels do not require direct sunlight to produce electricity, their output is improved greatly by the more light they receive. Ideally, they should be south facing and located in an area uninterrupted by shade from trees or other obstructions. Any excess energy you generate can be fed back into the grid through the Feed In Tariff scheme and earn you money. Find out more about the scheme, the requirements, the participants and the rates on the Ofgem website. Some Local Authorities offer grants for microgeneration installation. Contact yours to find out if anything is available. If you are planning your build then you have an ideal opportunity to incorporate these technologies into your house at the design phase. Speak to your designer or contact Microgeneration Certification Scheme MCS certified manufacturers and installers for advice on designing and integrating a system into your home. If you are considering incorporating several microgeneration technologies into your self build, speak to your designer about appointing a mechanical and electrical engineer to coordinate systems for optimum efficiency. It may be necessary to adjust the roof design to take account of the additional weight of photovoltaic panels. If you are using roof trusses, make sure that the truss manufacturer has all the necessary information to formulate their design. If you are adding photovoltaic panels to your existing home, contact an MCS certified installer for advice on design and installation. If adding panels to an existing home, changes to permitted development rights for microgeneration technologies in England and Scotland now mean that most photovoltaic installations can proceed without the need for planning permission. This is dependent on the installation remaining within certain size restrictions and not being in an area of special interest or on a listed building. Check with your local planning office before proceeding. Visit the the Energy Saving Trust for more information and up to date estimates on costs, savings and capacities. Return to our eco homes section for information on other microgeneration technologies and have a look through the rest of The Self Build Guide for more self building topics.